There's a large choice of Navigation Flight Logs for you to use that come in various shapes and sizes. In fact, you may even have crafted your own. Navigation is a hot topic, with a renewed emphasis currently being placed on both the instruction and implementation of this subject due to continuing controlled airspace infringements and poor radio communication skills. Here at Easy PPL, over the years we have developed our own Navigation Log to take Human Performance and Limitations, Airspace infringements and Radio Communications into account. Our Navigation Log has not only stood the test of time, but has been developed from over 30 years of experience - being tweaked and refined to the point where now, we are confident it's the best on the market. Unique design ensures in-flight writing only on the right hand side of the log. This allows the left hand side to over-hang the kneeboard if required without interference. Additionally, if required, the "Info & Clearances" section can be folded under either permanently, or to reveal a clean "Info & Clearances" section beneath as a continuation of writing space whilst retaining the original Navigation Flight Log data. No other navigation log prompts and allows space for three altitudes/levels during planning. Using this "best practice" approach ensures the flight takes place between the levels specified. Additional guidance on how to select the best "Minimum Altitude" (MIN) is detailed on our Best Practice Navigation Planning page. Other navigation logs have the navigation calculations contained on a single line along with the required Heading that is to be used in flight. This can lead to a simple human error in selecting the wrong information as the Heading to fly. By containing the navigation calculations separately, this error is simply not possible when using our Navigation Log. This feature is also tied in with the requirement that a navigation log needs to support all of the required elements to enable an instructor to successfully teach all of these aspects. Our Navigation Log prompts for calculations and references that other logs often ignore, such as True Air Speed (TAS), Freezing Level, Sunset, Deviation, Set Course time. Fuel planning is vital, and yet most navigation logs don't provide enough guidance. The dedicated "Fuel Plan" section prompts for correct fuel planning, now part of the legal requirements even for private flights (EASA AIR OPERATIONS PART-NCO). In addition, the unique "Fuel Management" section of the Navigation Log assures that endurance information can easily be gained directly without the need for further calculations. More guidance on this aspect is contained in the Navigation Flight Log User Guide (below on this page). Reminders on the content of initial and subsequent radio communication calls, plus position reports. Also includes mnemonic Mayday/Pan content plus transponder codes to use. Ample space at the pre-flight planning stage to document communication and navigation aid frequencies. Info & Clearances space is confined to a column that forces chronological writing order. This alleviates erroneously extracting old information such as pressure settings, squawks and clearances. Additionally, by being placed on the right hand side of the flight log, it facilitates folding the column beneath the current page to expose a fresh blank column on a further flight log sheet as a continuation sheet. The use of colour helps compartmentalise the flight log to aid planning and in-flight activities. Section separators (yellow), Reference and reminders (grey), Heading to fly (blue) and Divert Planning (pink). The Easy PPL Navigation Flight Log is the only flight log to use colour. At no extra cost. The introduction of Part-NCO includes specific requirements of a Journey Log. This Navigation Log has specifically been designed to encompass all of the necessary requirements. 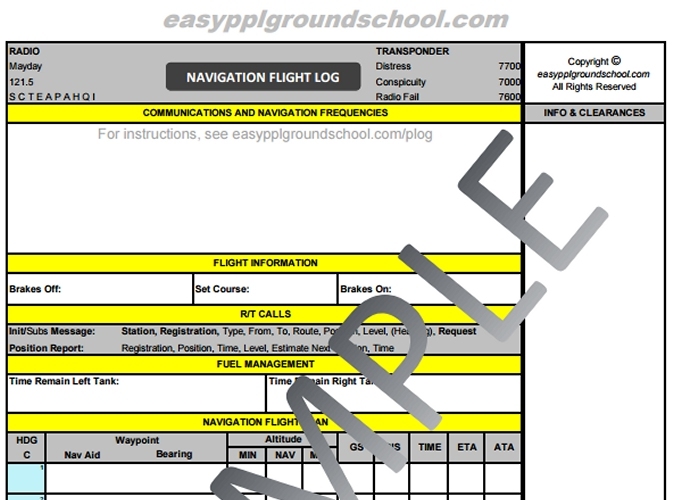 This section explains how to user your Easy PPL Navigation Flight Log. We strongly recommend you also read the Navigation Planning page to help ensure you have performed your pre-flight planning to the current best practices. Document legs to be flown in the NAVIGATION FLIGHT PLAN section, including distance DIS , minimum altitude MIN , navigation altitude you will fly NAV , and maximum altitude MAX before infringing controlled airspace. Document indicated airspeed IAS: and temperature oC: for the NAV altitude to enable calculation of Pressure Altitude PRESS ALT: and true airspeed TAS: . Document freezing level/altitude 0oC FL: and Sunset time SS . Document track TR T for each leg in the NAVIGATION CALCULATION section. Note this section is split into two columns of 7 boxes to provide calculations for the 6 legs in the NAVIGATION FLIGHT PLAN . Pink boxes should be used for the diversion leg. Complete NAVIGATION CALCULATIONS section using wind vector W/V to give true heading HDG T . Use magnetic variation V to give magnetic heading HDG M . Apply compass deviation D to give compass heading HDG C . The ground speed calculated as part of this process should be entered into the relevant GS box for each leg under the NAVIGATION FLIGHT PLAN section. Max Drift should be calculated and entered into MAX DRIFT . Transfer the NAVIGATION CALCULATIONS compass headings HDG C to the respective blue HDG C boxes under the NAVIGATION FLIGHT PLAN section. (The diversion HDG C is coloured pink). Under the NAVIGATION FLIGHT PLAN section, calculate the time TIME according to distance DIS and ground speed GS for each leg. Complete the FUEL PLAN section based on fuel flow FF , route time Route , contingency 5% , divert Divert , and reserve Res [EASA OPS PART-NCO for private flights suggests a 30 minute reserve by day, 45 minutes by night]. Departure, climb, descent and arrival fuel Dep/Climb/Desc/Arr should be taken into account (typically 15 minutes of fuel at cruise consumption). Calculate total required Total Required and amount carried On Board . Grey arrows help determine the direction of calculations required. Based on the amount of fuel carried On Board , complete the FUEL MANAGEMENT Time Remain Left/Right Tank: boxes to show the amount of endurance time provided by each tank. Document the required communication and navigation frequencies in the COMMUNICATIONS AND NAVIGATION FREQUENCIES section. The R/T section reminds you of the format of calls. Bold items are "initial" call content. In addition, the RADIO section at the top left of the log reminds you of emergency calls, including the content of a Mayday; Station, Callsign, Type, Emergency, Action, Position, Altitude, Heading, Qualifications, Information (e.g. POB). In flight, complete the FLIGHT INFORMATION Brakes Off: and Set Course: boxes as appropriate. Complete the first NAVIGATION FLIGHT PLAN estimated time of arrival ETA for the first leg. On reaching the first leg destination complete the actual time of arrival box ATA and populate the next leg ETA . Manage fuel by time. After 30 minutes, change tanks, reduce time remaining in the FUEL MANAGEMENT Time Remain Left/Right Tank: boxes by 30 minutes (e.g. Original figure was 02:00 (hh:mm), cross this out and write 01:30). Endurance is found by adding together the times in the Time Remain Left/Right Tank: boxes. At the end of flight, complete FLIGHT INFORMATION Brakes On: box. Cover and single sample flight log sheet. Actual pad consists of cover and 50 tear-off A5 pages. To buy pads of Easy PPL Navigation Flight Logs, go to our Easy PPL On-Line Shop.